Suspect was made on the crest of the Boulting Brothers' second wave, the socially comedic one that began with Private's Progress in 1956 and concluded with Rotten to the Corps nine years later. With a title that sounds like a crime mystery, Suspect explores the conflict that can arise between conscience and duty to nation or government. It's a film that gives both sides of the issue a fair shout but ultimately aligns itself with the establishment. Surprising this isn't – after all, the film was made in Britain in 1960 by a filmmaking team that weren't exactly renowned for their anti-establishment viewpoint. After years of work at a government research facility, Professor Sewell (Peter Cushing) and his team believe they have perfected a possible cure for typhus and plague and are finally ready to publish their findings. 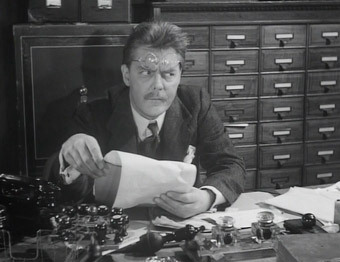 Before they can do so, however, Sewell is called to the office of Minister of Defence Sir George Gatting (Raymond Huntley), who informs him that although the team's bacteria may indeed save lives around the world, there are fears that it could also be used by a hostile power to spread the very diseases that it was designed to cure. Permission to publish is thus refused and the Professor's work is placed under the Official Secrets Act. Sewell's vocal frustration is echoed by his team, one of whom is persuaded by an outside body to take matters into his own hands. A slow start is used to introduce us to Sewell and his colleagues, who consist of good natured Dr. Shole (Kenneth Griffith), good looking Dr. Bob Marriott (Tony Britton) and pretty young Dr. Lucy Byrne (Virginia Maskell). Few will gasp with surprise at the news that Bob and Lucy are dating, but the circumstances might still catch you out. Lucy, you see, is still living with her ex-fiancé Alan (Ian Bannen), who lost both arms in Korea and is bitterly dependent on her for even the smallest things. Alan knows about Lucy's relationship with Bob and encourages it, though as much out of self-hatred than a desire for her happiness. 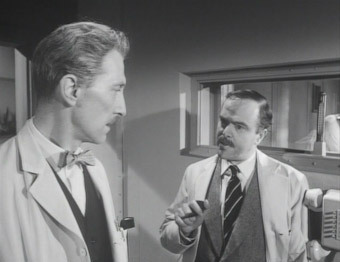 He even goes to the lab to introduce himself to Bob and invite him out for a drink, and it's then that Bob is introduced to the shifty Parsons (Donald Pleasance), who takes an immediate interest in his complaints about work and feeds his desire to ignore government orders and see the paper published, even suggesting that he may be able to help the good doctor achieve this aim. It's safe to say that Suspect is some way from the Boulting brothers on top form. The low budget shows in the limited (studio) locations and the reliance on talk over action, and there are a couple of later plot developments and conclusions that would be unfair to reveal, but which I for one found irksome. Attempts a comical diversion involving Irish orderly Arthur (Spike Milligan in a role he won't be remembered for) and a smarter-than-him chimpanzee fall woefully flat, and as a lead character Bob is desperately in need of personality boost. Nonetheless, there's good stuff within, with a sprinkling of impressively written and sincerely performed monologues and dialogues, the first of which involves Gatting outlining the government position to Sewell, and in typical Boulting fashion, both men get to have their say in persuasive fashion. But the most entertaining speeches are delivered by security investigator Prince (a delightful Thorley Waters), a borderline eccentric whose befuddled chumminess proves a surprisingly effective investigative technique and frankly deserves its own movie. For me it's Prince and these dialogue highlights that made Suspect worth my while, though I have to question the smarts of a special agent whose first action on breaking in the door of a gas-filled flat is to switch on an electric light. A 4:3 transfer that is clearly cropped from something wider, either 1.66:1 or 1.85:1, resulting in a few heads being cut in half and in one shot almost completely removed. The print is clean but a tad on the bright side, weakening the contrast but not to a distracting degree. The Dolby mono 2,0 soundtrack is damage and hiss free, the dialogue clear within the restraints of a dynamic range typical of a low budget British film of the period. An interesting and undeniably entertaining drama whose plot holds few real surprises but whose dialogue sometimes delivers the goods, and it's almost worth seeing for Thorley Walters alone. Another serviceable but bare bones disc from Optimum's Boulting Brothers Collection.